Technika 22-212i review | What Hi-Fi? Money spent at Tesco accounted for roughly £1 in every £8 of total UK annual retail spending according to the latest figures from the Office of National Statistics (ONS). A lot of us are doing a lot of our buying under this supermarket’s roof, and inevitably this has spread to electronics. 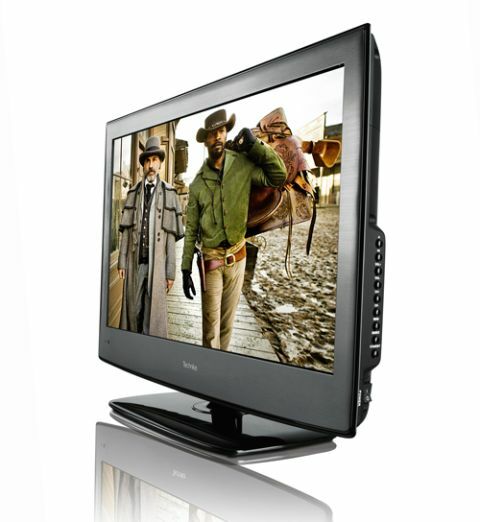 It’s easy to see why, when you can get this Technika 22-212i TV from Tesco for just £178. The ultra-budget sets are smaller and pack a wealth of features and functions. But is this one a good deal? Built with second rooms and bedrooms in mind, this Technika LCD TV has a Freeview TV tuner, an integrated DVD player and – almost unbelievably at this price – internet connectivity and a basic smart TV platform that includes BBC iPlayer. Out of the box it’s hard to get away from the fact that it looks like a small, budget TV. The DVD slot is tucked in on the right hand rear edge of the rear panel, along with a smattering of fiddly, small buttons. Round the other side you’ll find a couple of HDMI inputs, a USB slot that can play pictures and music and RGB SCART, headphone and ethernet connections. Technika has even bundled a wi-fi dongle, so you needn’t trail a cable to your router. The smart TV screen is simple but effective, giving you access to BBC iPlayer, plus YouTube, Facebook and Twitter. The remote control comes into its own here. It’s a two-sided affair offering up a full Qwerty keyboard on the rear to enter text when searching for content. The remote is otherwise a little clunky as a result of being so button-heavy. The Freeview tuner does without HD but delivers decent quality pictures from standard-def content. The 1366 x 768 resolution proves more than enough for such a small screen: edges are sharp, pictures are largely free from noise and the overall colour balance is about right if a little overcooked at times. It’s more of the same from the integrated DVD player. Some backlight bleed creeps in at the top and bottom of the screen but otherwise pictures are very watchable. The sound quality isn’t great, toughening up quickly at high volume. Connect a better source – or feed it Blu-ray – and the TV looks great. For a second room, bedroom or kitchen, this is a fine value, feature-packed TV.